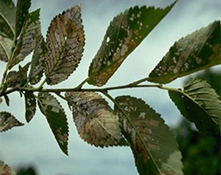 European Elm species are most susceptible to damage and American and Siberian Elm are less preferred. Most Chinese Elm, Zelkova and many of the newer Elm cultivars are infrequently fed upon. 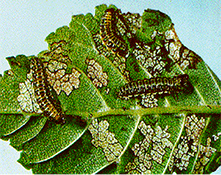 Larvae skeletonize the leaf surface, while adults eat through the leaf, often in a shothole pattern. High beetle populations can entirely defoliate trees, eliminating shade, reducing aesthetic value and causing premature leaf drop. Repeated extensive defoliation weakens elms, causing trees to decline. Adults are olive-green with a black longitudinal stripe along each margin and down the center of the back. Females lay yellowish to gray eggs in double rows of about 5-25 on the underside of leaves. Newly hatched larvae are black. After feeding in the canopy for several weeks, mature larvae crawl down the tree trunk and form pupae around the tree base. 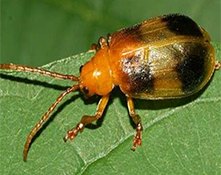 After about 10 days, adult beetles emerge and fly to the canopy to feed and lay eggs. Adults commonly overwinter in bark crevices, buildings, litter and woodpiles. There are one to three generations per year. Healthy Elms can tolerate substantial defoliation. Trunk banding can reduce populations if installed prior to the larvae crawling down to pupate. Evaluate the need and effective timing for treatment using one or more of several methods, depending on the planned control method and your resources available for monitoring. Some practices may require professional help. If populations warrant treatment, carefully timed applications of pesticides must be based on the optimal time for monitoring and then for applying treatments.